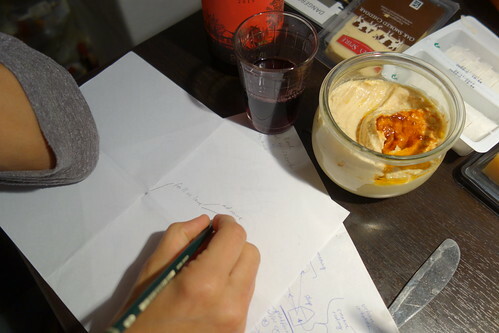 Wine, hummus and how to make people fall in love with an e-textile tailor shop? As part of our WEARsustain Main Mentoring with Frank Becker, he asked us to use the Backward casting method to imagine where we want to be at the end of our shop year. What do we see, feel, hear, smell in this future? The following is a summary of the brainstorming, discussing and storytelling that came from this exercise which took place with hummus, good wine and roast vegtables. LONGING: to be missed. To leave a behind a hole, to have created a longing for our story to be true, or for it to continue. QUANTITY: to have realized and documented 30 commissions. QUALITY: for these commissions to be diverse and some completely unexpected, so that even we are surprised. DOCUMENTATION: to be ready to start work on the final KOBA Katalog documentation. Backtracking from this point in the future, here are some of the ideas/strategies we’ve come up with that could lead us to reach that future moment, 8 months from now. For people to miss us, they need to fall in love with us, with the idea that a space like ours is not just a temporary theater piece, but a reality. A part of their everyday lives. If people should fall in love with the idea of our shop and all that it entails, our shop needs to be “running perfectly” for a good amount of the time we are here (at least 4-6 months). Currently we are very much a “work in progress” and not communicating the shop concept visibly to passers-by. For it to run perfectly we need time to explore, experiment and refine the concept as well as it’s execution. From now until end of December 2017 (roughly Christmas) we have 2 months, this can be our first experimental phase of trying to run perfectly. Over the Christmas break we re-evaluate and give ourselves another 2 months (until February 28th 2018) to adjust our strategies and try to run perfectly again. Then we have 4 months left to be actually running perfectly up until June 2018. The stories that we tell of the customers who came to commission this and that which will be told through documentation of what we are making. But also, we are characters in this performance/story. Are we fully ourselves? Do we play rolls, put on costumers, invent quirks that make us more lovable? We definitely need to make ourselves our own wearable technology commissions! It is almost ridiculous that we aren’t already wearing something. What we make/offer should be “loveable”. This does not mean we can’t be critical. Critical people will fall in love with critical concepts. Do we want everybody to fall in love with us? The types of technology we offer and the commissions we decide to take on and those we decline will influence who this audience is. Do we need to love what we offer? Yes. This does not mean we can not realize something we disagree with, as long was we love the fact that we are enabling diversity beyond our own preferences for what we personally like/dislike. We will still decline to make commissions we disagree with for other reasons. Our shop space is huge, central and we will not be working 24/7. 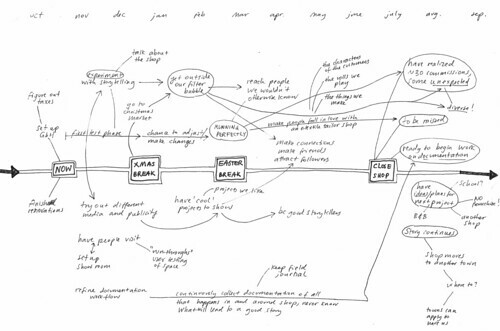 How else can we use this space to engage people with the concepts of the project? 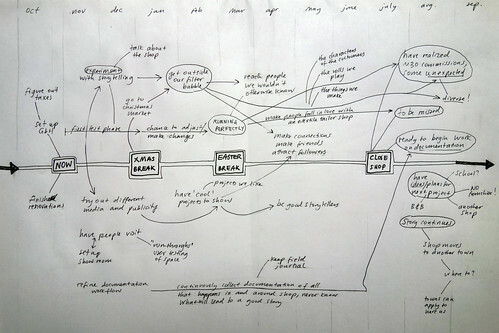 One idea is to curate a series of “Shoptalk” evening presentations and discussions around the topic of “Urban Craftspersonship as a viable means of living and being”. On weekends when the shop is closed we can also imagine hosting a series of hands-on workshops lead by invited makers. During summer we plan to organize a 2 week E-Textile Summer School in the space and in September will end the project with a final exhibition. Just by being in the space we’ve met a few of our neighbours and curious passers-by. We hope this will continue, and maybe some of the above events will also appeal to locals, not just people in the field. We could also consider hosting events closer to the direct local community, or make an effort to join events/initiatives that are already happening in the neighbourhood. There are 35 weeks between November 1st 2017 and June 30th 2018. Of these weeks, we will have about 30 working weeks. If we want to realize 30 commissions in this time we need to make one item per week. Sounds reasonable, both in terms of receiving ideas from people as well as our ability to realize these custom designs. Still, we should not underestimate what it will take to illicit commissions from people previously not involved with Wearable Technology. Spreading word of our shop and inspiration through the examples we make is one way to insure we will receive at least one commission a week. What seems more challenging is how do make sure these commissions are not all replcias of the examples we provide. We’re very happy to be making custom replicas because we believe the customization process will lead to unique results and a personal experience of having it made. But we also want to attract/illicit some new/novel, strange/unusual ideas. We must break out of our filterbubble. Both the filter of our reach (friends, colleagues, community), and the filter of our examples. How do you break out of your filterbubble? We should leave the studio and go to places we would not normally go. Set up a stand at a Christmas market and promote our shop’s story there. Do a performance in the amphitheater in Görlitzer park. We should promote/spread/share our idea with as many people as possible. Make use of local and online storytelling media, write a press statement, use social media. We still need more ideas. This documentation should be published (made public) as soon as possible, not saved for the very end. We use our website and social media platforms to share the story as it develops. But also our shop space is a showroom for this story to unfold. The KOBA Katalog and the closing exhibition are just the accumulation of all this stuff. We need to write a press-release and find some journalists to write about our project. It would be amazing if we could find somebody interested in following our story and reporting on it at different moments in time. Or, at the end of the year do we reveal the simple truth that our story was not a viable means of surviving in the current economy? We could end by painting a bleak picture of this dystopia to come if we continue working, producing, consuming and living in the system we do. Do we end on a positive or negative note? This Backcasting exercise caused us to question and define what the core motivation/concept of our shop is. In the conversation that followed we boiled it down to “A Platform for Democratizing Technology Production to create Digital Diversity“.